I turn off the Stewart-Cassiar onto “The Cutoff”; 55 km of nasty, rocky gravel that takes me into the town of New Aiyansh and leads on to Aiyansh Hot Springs. 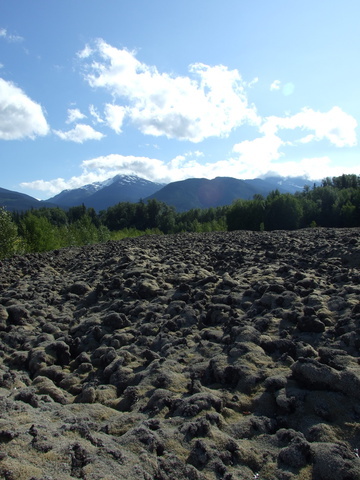 I cross into Nisga’a Memorial Lava Bed Provincial Park, an area of relatively recent volcanic activity. I pass by many “lava beds”, massive regions of beautiful, otherworldly volcanic rock. Walking through them is a very strange experience – they are covered in moss but otherwise have no signs of life. The road has been sealed since the Glenn Woodsworth wrote his directions but they are otherwise spot-on and I have no trouble finding the little pull out. A five minute walk has me at the springs, which I have all to myself. Two hot vents and two cold water pipes flow into a gravel pit, which has been fitted with two drain pipes. 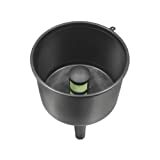 I plug the drain pipes with the provided yogurt tubs and set about exploring the area while the pool fills. I notice the cold water is not as cold as it should be. This combined with the sulphur deposits on the rocks has me convinced there is another vent somewhere up that stream. 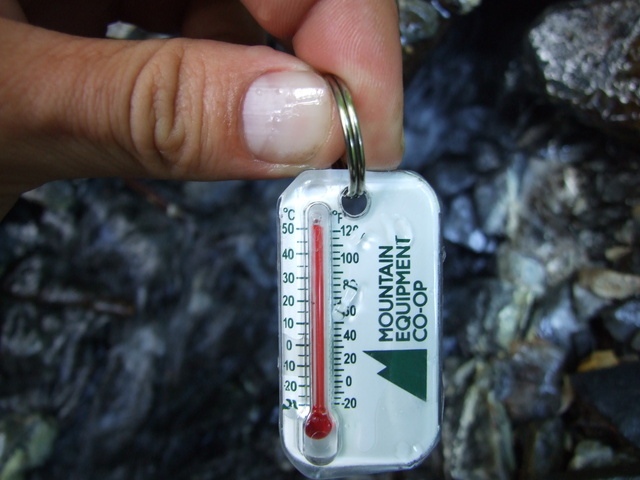 The flow rate from the main vent is excellent and it’s hotter than the 50 ˚C maximum my little thermometer can handle. The second near-by vent is just as hot, but is not much more than a trickle. The water has a very strong sulphur smell – not enough to deter me, but I can see how some people would be bothered by it. There are some attempted man-made structures in the area, really just some falling down pieces of timber. I soak for an hour by myself, then share with a group of three for half an hour before heading off. I return for two hours in the morning for an amazing soak just as the sun is rising. Good observation about the creek! 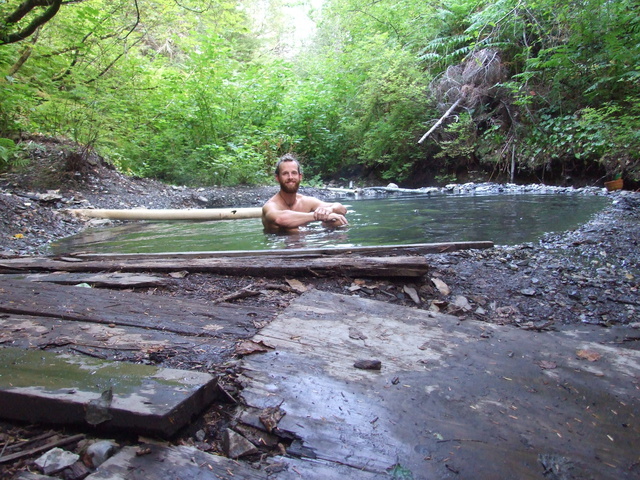 There are actually two springs in the creek, both of which help warm it up. I don’t know why this spring doesn’t see more visitors. Haha – I thought so! It is a really great spring; hot and not busy at all. 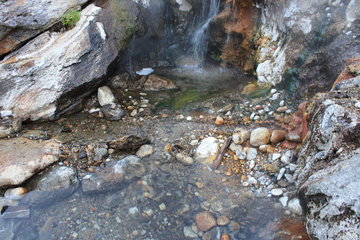 I do know a lot of people that are turned off a hot spring by even the slightest sulfur smell. Amazing drive down the Stewart-Cassiar…I should have taken more time to explore like you did. I guess I will have to go back next year. Hey Carmen. Yep, I had an awesome time driving down. 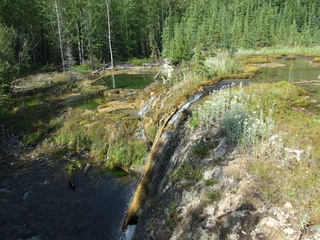 Stewart and Hyder are well worth a visit, and the road into Telegraph Creek is pretty cool too. Take care of yourself and keep in touch. I’m planning a trip through British Columbia later this Spring and your blog has been super helpful! However, although I have Glenn Woodsworth’s book and understand most of the directions, he made this set of springs sound hard to find. I was wondering what road that he mentioned was closed and if you have any suggestions for having an easier time finding the spring? Thank you! I remember this one well. Glenn’s directions are spot on, and you’ll have no trouble finding the spring. As I recall, the only difference is the road is now paved, so at one point Glenn says something about gravel, but there is none now. When you get there, you’ll know for absolute certain.. there is a rough parking/lot pullout on the left at exactly the right distance in Glenn’s book, and a small trail leads off. Flagging tape/etc. make it a dead giveaway there is a hot spring nearby. Have fun, I’d love to hear what the spring is like now! I’ve been meaning to reply to this for awhile now (half a year.. oops) but we found the springs! The problem was that I was using and old version of Glenn’s book that just said the area had been flooded and gave an approximate mile marker. ha. Anyway the Spring looks a lot like it does in your pictures! We had a great time at the spring, however on the way back to vehicle we had a bear scare. Overall a very worthwhile experience. That’s awesome, I’m glad to hear you made it. What time of year was that? I was just in Terrace in early Jan and there was not a lot of snow in town.. I almost drove out to the spring, but found other entertainment instead. I’d love to get out there in the winter! That was around Midi-June when we went, I would rather go in the Winter too to avoid the bears. I saw in Hot Springs of Western Canada that there was another decent hot spring in the area, but it required a boat to get to. I was wondering if you had checked out that one? Hey Becca, I hear bears can be a problem at Aiyansh sometimes. I didn’t see any when I was there. There are actually quite a few springs in the area, if you have a boat. I don’t, but I would love to spend a few weeks exploring the area! 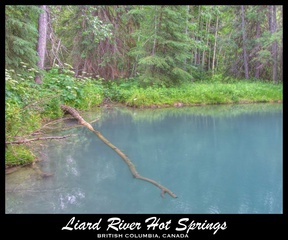 The latest edition of Hot Springs of Western Canada has all the details, it’s well worth a read.